If you want a graceful, spreading shade tree that is an American native, live oak (Quercus virginiana) might be the tree you are looking for. Live oak tree facts give you some idea of how impressive this oak might be in your backyard. The tree grows some 60 feet tall, but the strong, sinuous branches can spread to 120 feet wide. 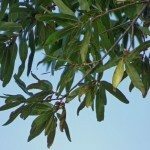 Read on for further information about how to grow a live oak tree and live oak tree care. If you are thinking of a live oak tree growing in your garden, consider the size, shape and other live oak tree facts before you jump in. With its deep, inviting shade, the live oak looks like it belongs in the Old South. It is, in fact, the state tree of Georgia. This mighty tree’s crown is symmetrical, rounded and dense. The leaves grow in thickly and hang on the tree until spring, when they yellow and fall. Its beauty aside, the live oak is a tough, enduring specimen tree that can live for several hundred years if planted and cared for correctly. However, the tree is vulnerable to the fatal oak wilt disease, spread by insects and infected pruning tools. Learning how to grow a live oak tree is not difficult. Perhaps, the most important thing is finding a site with sufficient space to accommodate the tree at its mature size. In addition to the height of the tree and spread of the branches, the trunk itself can grow to 6 feet in diameter. The wide surface roots might in time lift sidewalks, so plant it away from the house. The live oak tree is undemanding. You can start a live oak tree growing in partial shade or sun. And don’t fret about soil. Although live oaks prefer acidic loam, the trees accept most types of soil, including sand and clay. 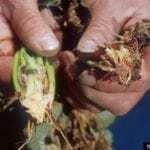 They grow in alkaline or acidic soil, wet or well-drained. You can even grow live oak by the ocean, as they are tolerant of aerosol salt. Live oaks resist strong winds and are drought tolerant once established. When you get your live oak tree growing, you need to think about live oak care. This includes regular irrigation while the tree is establishing its root system. It also includes pruning. It is critical for this giant oak to develop a strong branch structure while it is young. Prune out multiple leaders to leave one trunk, and eliminate branches that form sharp angles with the trunk. Caring for live oaks properly means pruning the trees each year for the first three years. Never prune in early spring or the first month of summer to avoid attracting the insects that spread oak wilt disease.